Zucchini Coming Out of My Ears!! Seriously, it’s coming out of our ears. SO MUCH ZUCCHINI. The plant has taken over the raised bed and every day there is more zucchini. I guess the heat wave we had recently made our plant flourish. I needed some creative ways to eat the zucchini. With so much, just having it as a side dish with every dinner gets old quick. By the end of summer I plan on shredding a bunch of zucchini and freezing it like I did two summers ago. It was nice being able to make zucchini bread in the winter. This was the first recipe I tried. 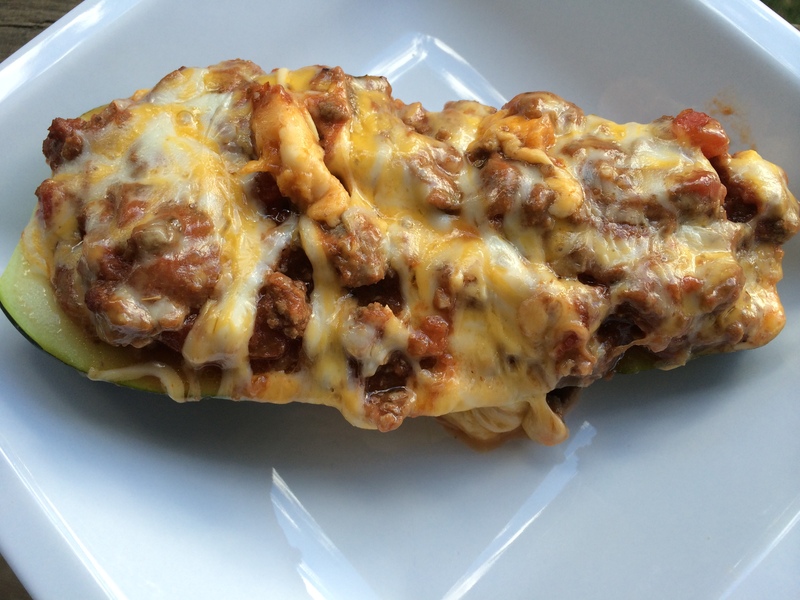 I went off this recipe from Skinny Taste, Sausage Stuffed Zucchini Boats, but really just used it as cooking instructions. At some point I will try the actual recipe because it sounds delicious. But I had some leftover cooked ground beef and onions and homemade spaghetti sauce that I just mixed together and used for this recipe. It made it a quick and easy meal. I cut the zucchini and used a spoon to scoop out some of the seeds and innards. 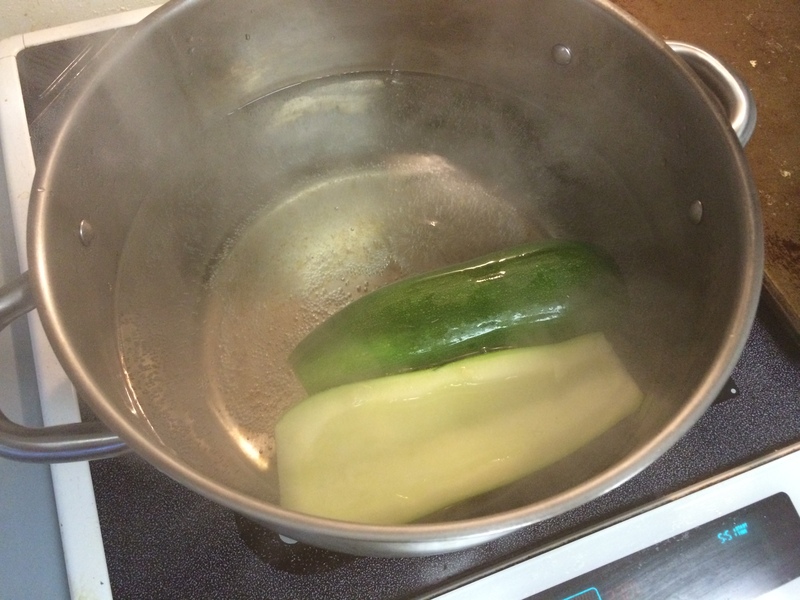 Then I boiled the zucchini for about 2 minutes. In a bowl I mixed together the spaghetti sauce, beef and onions. 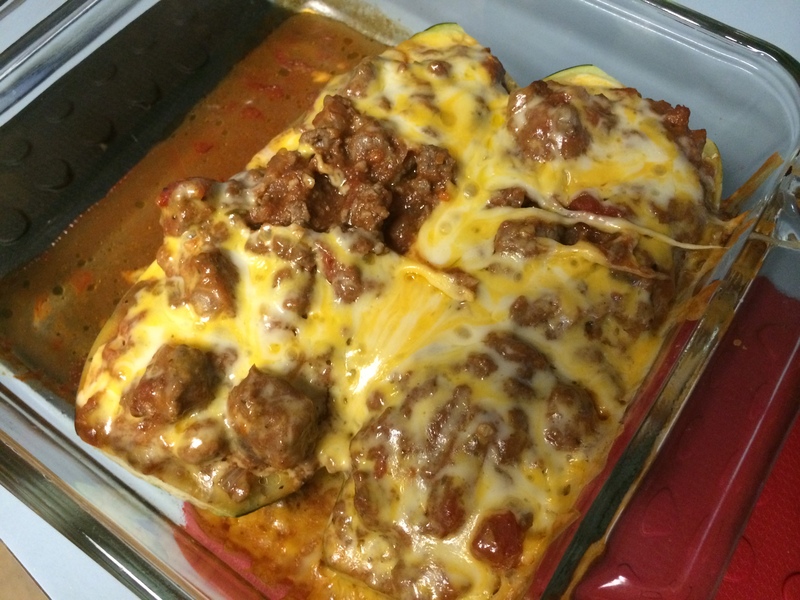 I added a little bit of salt and pepper to it and then put the meat in the zucchini “boat.” I topped the meat with shredded Colby Jack cheese (it was all we had). I baked them at about 425 degrees for 30 minutes. Michael and I split one large zucchini for dinner and it was plenty of food. It was so filling and I love that it was low in carbs. We both agreed that it definitely needed some spice to it. Next time I’ll add some red pepper flakes or maybe use spicy ground sausage instead of beef. Yum! Yum! Love the concept of this recipe and will definitely try it again. I’ve done a couple other dishes using zucchini, but not really using a recipe. One of my favorites was gnocchi topped with homemade spaghetti sauce and sauteed zucchini. I love the combination and it was really delicious and filling! I used this recipe for zucchini bread. Even though it was low in sugar, it was still a little high for my liking. I reduced the amount by using 1/2 a cup of Splenda and 1/2 a cup of unsweetened applesauce. By doing that I reduced the calories per serving by over 100 calories. I also used Trader Joe’s Gluten Free flour. Preheat oven to 350F/175C. (I used a toaster oven so it didn’t heat up the house.) 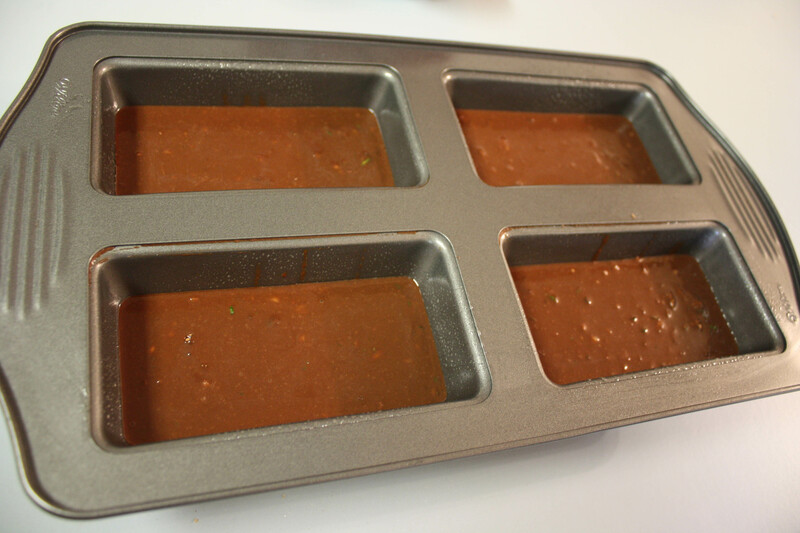 Spray a loaf pan with nonstick spray. In a small bowl, combine the eggs, sweetener of your choice, brown sugar, oil, vanilla, and buttermilk. Stir in the grated zucchini. In a slightly larger bowl, mix together the white whole wheat flour, baking soda, baking powder, unsweetened cocoa powder, and salt. Bake 45-50 minutes, or until a toothpick inserted into the center of the bread comes out clean. Let bread cool in the pan, then slice and serve. This recipe was great! Michael had it for breakfast a few times, it worked great for that because it wasn’t overly sweet. I had skipped the nuts and I think next time I will add some. The bread needed a little bit of texture to it. I was impressed with the subtle flavor and the airy texture. 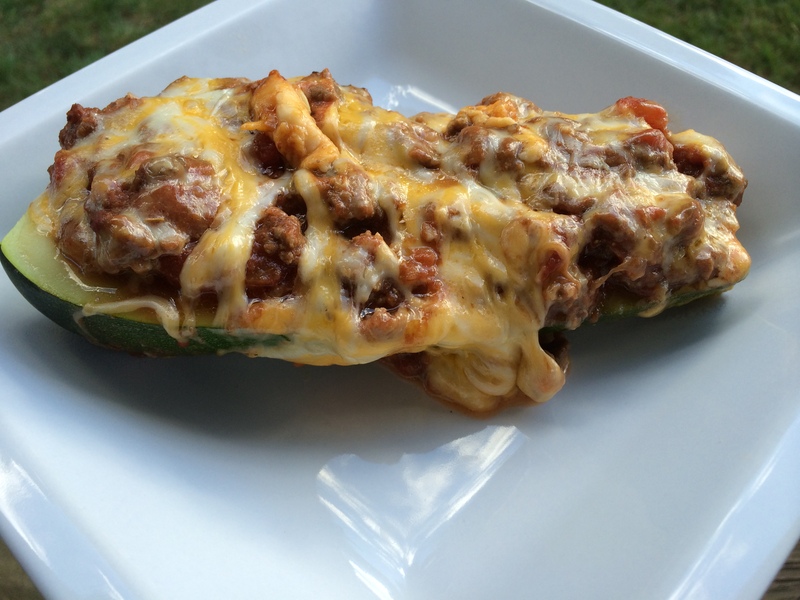 I would definitely make this recipe again and it was a great use of zucchini! I might even add a little more zucchini than the recipe calls for. 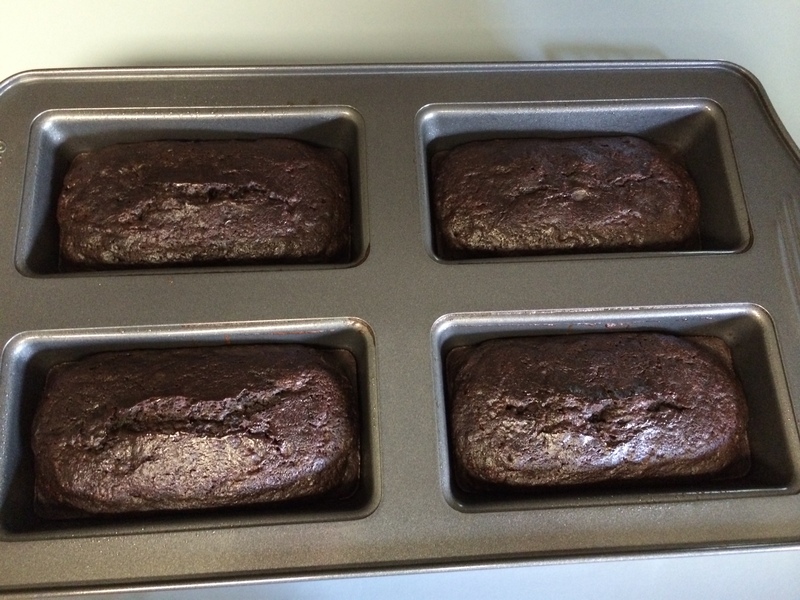 With my alterations and using the mini loaf pan, I estimated about 18 servings…so that makes the calories around 129 per serving. Do you have a tried and true recipe to use up zucchini? Pass it on to me! We have the same issue right now! We planted a yellow squash and two zucchini plants this year and I’m running out of ways to cook it. I really like this recipe, it’s versatile because you can substitute the herbs (I use cilantro) and you can leave the nuts out and they are just as good. http://www.epicurious.com/recipes/food/views/Turkish-Zucchini-Pancakes-1208. I usually make a lot of them because leftovers are good too. I can just eat them cold for lunch the next day. My husband likes it when I cook zucchini down to mush. It sounds gross, but it’s kind of like a mashed potato substitute. I cube it, cook it way down until it’s falling apart, drain remaining liquid, then add seasoning and some parmesan cheese. It tastes good, but you have to be okay with the texture. I learned the first year we had a garden that one zucchini plant was enough! I cannot imagine having multiple! I also shred up a bunch of zucchini and then freeze it. I did this a few years ago and had zucchini in the winter for making zucchini bread. Thanks for the recipe link. It sounds delicious! I have a zucchini pasta dish on my menu, but I may need to make your boats – haven’t done that in a while – and crushed red pepper is a staple in any dish I make that I know my husband won’t touch! I’ve had this zucchini pizza crust on my list of things to make – haven’t had time yet though! Ooooh! Zucchini pizza crust? That sounds great! We’ve also sliced it up and heated it around with a sliced up Polish sausage for dinner and its so good! We’ve done something similar. It’s tasty that way too. 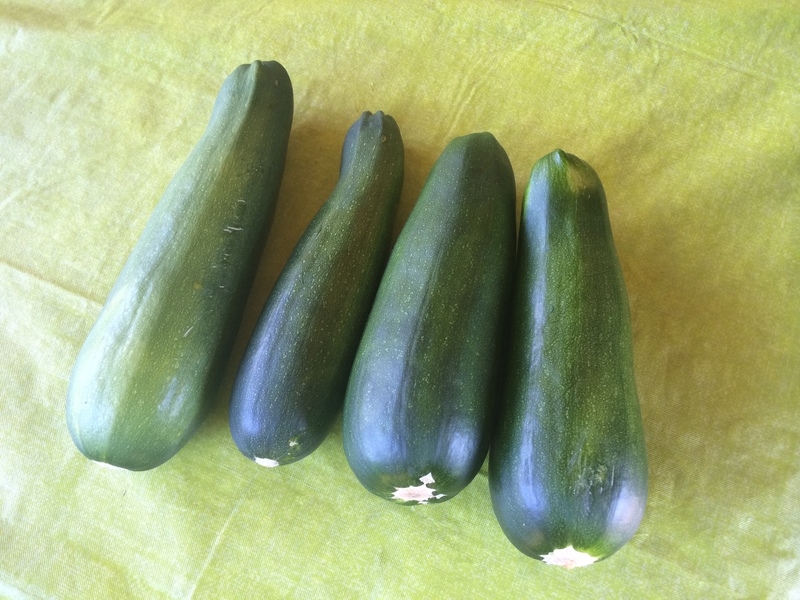 We planted zucchini a few years ago, and I remember making a lot of zucchini soup. I don’t think I have a recipe written down. I basically just sauteed the zucchini with onions and garlic, then added broth and spices and after the zucchini were soft pureed the soup. I know we really liked it. I should make it again and write down a recipe of the version I really like! Zucchini soup sounds interesting! Never heard of it! I want to plant zucchini! Our new house has raised beds and I can’t wait to rip everything out and start again. 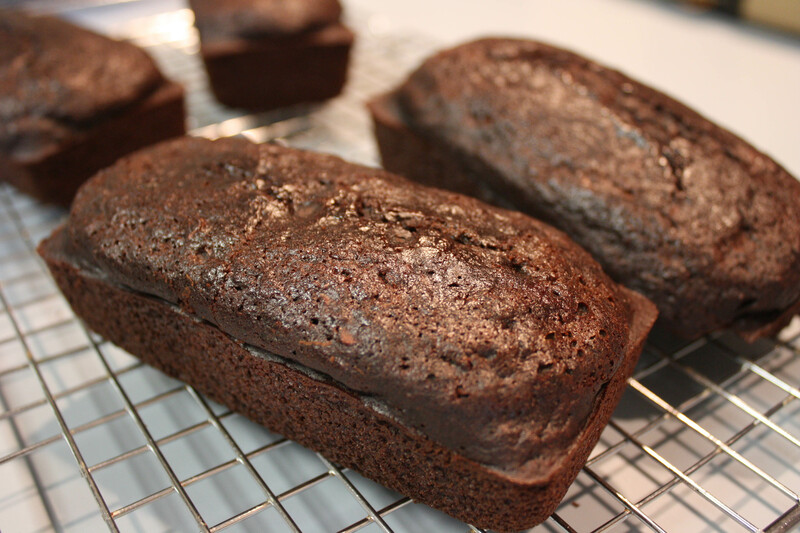 I make a zucchini chocolate cake, so I’d make 100 of those and freeze them and never have to worry about what to take to a dinner or morning tea again. If you’re wanting a more pactical option… well I don’t have one, lol! Ooh! Zucchini cake sounds so tasty! Mmmm. What a yummy-looking Zucchini. A friend passed this zucchini quiche recipe to me. It was great! I loved it for lunch. I used 3 zucchini instead of the 1 it called for. If you have a food processor you can grate the zucchini super fast and then grate the cheese right after. Thanks for the link! I will definitely check it out.